Santeria (Santería in Spanish, meaning "Way of the Saints") is a set of related religious systems that fuse Roman Catholic beliefs with traditional Yorùbá beliefs, that over time became a unique religion in its own right. Properly known as Lukumí in the Yorùbá language, meaning "friendship," Santeria was the religion practiced by descendants of many Yorùbá slaves in Cuba, over time growing in popularity with many people in Latin American countries and eventually spreading to many regions of the Americas. Estimates of the number of practitioners of Santeria are difficult, due to its decentralized structure, autonomy of individual house-temples, and Santeria's relaxed approach to other religions. However, most estimates suggest there are about four million adherents worldwide, about three quarters of which reside in Cuba. The Yorùbá people originated from Western Africa in the area known today as Nigeria. Their indigenous pre-Christian religious beliefs remained popular among the descendants of West African slaves. In the early eighteenth century the Spanish Catholic church allowed for the creation of societies called cabildos, modeled on religious guilds existing in Spain, which were primarily for African ethnicities and provided means for entertainment and reconstruction of many aspects of ethnic heritage. Yorùbá slaves practiced Yorùbá religious ceremonies in these cabildos, along with religious and secular traditions from other parts of Africa, combining and amalgamating their masters' pantheon of Catholic saints with their own pantheon of Orisha which is the Yorùbá word for god. The birth of Santeria in Cuba was primarily due to this convergence of Yorùbá's religiosity and Catholicism. When slave owners observed Africans celebrating a Saint's Day, they were generally unaware that the slaves were actually worshiping the Orisha. The slaves' Christian masters did not allow them to practice their various west African religions; however, the slaves found a way around this by masking the Orishas as Christian saints while maintaining their original identities. Today, the terms saint and Orisha are sometimes used interchangeably in the Santeria community. The common bond between the Lukumí Orisha and the Catholic saints has become a part of Cuba's religious culture. The word Santería (Way of the Saints) was originally a derisive term applied by the Spanish to mock followers' seeming over devotion to the saints and their perceived neglect of God. Forms of the Lukumí religion are practiced throughout the Americas and the Caribbean, with followings in Mexico, Argentina, Colombia, Venezuela, the United States, and other areas with large Latin American populations. In modern Santeria, there is no contradiction for those who wish to participate in Catholic mass and consult Santeria oracles, or combine any other religious tradition with Santeria. The followers of Santeria believe in a creator God who is called Olodumare. There is no specific belief in a devil since the Yorùbá belief system is not a dualistic philosophy (good versus evil). Incidentally, morality is seen as quite complex. There are no actions that are purely "good" or purely "evil"—all declarations of right and wrong are based on the circumstances in which they arise. Within each person, and most Orishas, are the potential for good and the potential for evil. Santeria stresses harmony, especially harmony with one's own destiny, and thus good in Santeria is the congruence of one's actions with one's destiny. The rites and beliefs of Santeria—especially the use of oracles—are thought to facilitate that congruence. A central idea that defines Santeria is ashé, the indefinable primal force that extends from the creator and exists in everything, in varying amounts. As ashé is in everything, Santeria recognizes and respects the value of nature and all living things. As well, all religions are regarded as beneficial, as they in some (without knowing it) recognize the creator and the ashé that permeates the universe. Followers of Santeria typically recognize that all religions have a degree of truth. There is no central scripture for Santeria, as the there is no organizing or presiding institution to regulate such matters. Information had been handed down orally for centuries in poetry, mythology, and history, though in recent times has been preserved in a book known as the Corpus of Ifa. There is no accepted standard copy of this book—there are a variety of versions, based on different regions and lineages. In Santeria, the eternal creator of the universe (and all things including humanity and the Orishas) is known as Olodumare. Olodumare is referred to by a number of epithets, such as Olofi ("God on earth") and Olorún ("Owner of the Heavens"). Said to be made up of ashé (primal force), Olodumare created the universe from the chaos of ashé and Olodumare, and all things came to be. It is said that during this process creation, the primordial human, known as Omo Oba, was created. However, Omo Oba was said to be conceited in his immortality and therefore subsequently banished to the underworld. Thereafter, the world was rebuilt by Olodumare and during this second creation the Orishas were born, beginning with Obatalá. Obatalá, the first created Orisha, descended to the earth on a golden chain to create dry land for life (specifically, human life) to thrive upon. Then the newly created goddess of the sea Olocun covered the earth with her waters in order to claim it for her own. It is said that eventually Olodumare became disenchanted with the world he had created, and was disappointed with the actions of humanity. Though still acknowledged as creator and the controller of ashé, Olodumare is now separate from the world. Those who practice Santeria continue to revere Olodumare and include him in their prayers and sacrifices, but only out of respect and not in hopes of petitioning him, as he is uninterested in the affairs of humanity. In his absence, he has left the earth to the Orishas. The head of the Santeria pantheon is Obatalá. It is said that when humans were created they were created without heads. Obatalá was given the task of fashioning heads for humanity, and thus became the father of humanity as well as the Orishas. He acts as a mediator between the Orishas and Olodumare, the latter's whereabouts following his departure from the earth known only to Obatalá and the Orisha Ellegguá. Obatalá's color is white and was linked with Our Lady of Ransom in the Catholic tradition. The trickster Ellegguá worshiped in Santería. Ellegguá is the trickster Orisha, and is the god of crossroads and doorways. In mythology, he is known for eavesdropping on his fellow Orishas and spoiling their plans. Sacrifices in Santeria always begin with an homage to Elegguá, as he was granted prestige in his service to Olodumare. His colors are red and black and in Santeria he is compared to the Holy Child of Atocha, due to Elegguá being recognized as the youngest Orisha. His image, if located in a home, is almost always found on the floor and near a doorway. Changó, the Orisha of thunder and fire, is known for submitting to his desires for celebration and his disposition for anger. He is known for his power and is respected for his ability to overcome barriers. He is also recognized for his sexuality and is a symbol of male fertility. His home is thought to be in the clouds, in an impressive castle. In mythology he is often at odds with his brother, Oggún. His colors are red and white and he is identified with the Catholic saint Barbara, whose murderer was struck by lightening. Oggún, Changó's brother, is the Orisha of iron and war. As such, he is the patron of all whose tools are made of metal—soldiers and doctors, for example. He is in charge of vehicles, such as automobiles, but is also blamed when traffic accidents occur. He is also identified with his major implement, the machete, and in legend it is said that with his machete he cleared pathways through the primordial jungles that grew after creation. Mythology often tells of his humiliation by a variety of others (often his brother Changó or Oggún's own wife) and his retreat to a life of solitude deep in the jungle. His colors are green and black and is identified with St. Peter, who in Catholic iconography holds metal keys. The Orisha Orúnla is the god of divination. He communicates through the use of oracles, and is thus linked to divination. In most depictions he is shown with the Table of Ifá, the system which he created and grants use of to santeros and santeras (the ordained priests and priestesses of Santeria) making use of oracles. In mythology, Orúnla is known for his devotion to his friend Elegguá. His colors are green and yellow and he is identified with St. Francis of Assisi. There are hundreds of other Orishas recognized by groups within Santeria though less then twenty are the most prominent. As well, each Orisha may be connected to more than one Catholic saint. Within Santeria, legends concerning the Orishas are called patakis. Santeros and santeras recognize that these need not be literally true, but rather that the essence of what is being taught through them is what is to be gained by knowing and telling patakis. Interpretation and recitation of patakis can vary between regions and individuals, as Santeria has little fixed dogma. One pataki concerns the anger between the brothers Changó and Oggún. Unknown to Changó, Oggún had begun an affair with their mother, a serious crime in Santeria. Elegguá became aware of this affair and alerted his father, Obatalá, who put an end to the matter and punished Oggún severely. When Changó learned of the matter he exacted his revenge by seducing Oggún's wife. The two, as a result, are still in combat with one another. Another pataki describes the result of this affair. The Orisha Orúnla was born of this union, and Obatalá commanded Elegguá to bury his recently born illegitimate brother. Elegguá complied, but only buried Orúnla up to his head (unbeknown to Obatalá), which he left in the shade of a large tree. Orúnla learned divination from this tree. In time his father Obatalá wished Orúnla were alive, and Elegguá delighted him by informing him of his trickery. They were reunited, Orúnla was released, and they remained a happy family. There is also a pataki that informs of one of Elegguá's services to the creator god Olodumare. Before he had decided to leave, other Orishas plotted against Olodumare in order to gain control of the ashé which he presided over. Knowing that Olodumare was terrified of mice, they plotted to lock him in a building filled with vermin. Elegguá, eavesdropping as he often did, became aware of this conspiracy and decided to act against it. When the plot was launched against Olodumare, Elegguá burst upon the scene and devoured the mice to calm Olodumare's fears. In turn, Elegguá gained even more favor in the eyes of Olodumare. Some Lukumí rituals are open to initiated priests only, so are seen as highly secretive by the outside world. 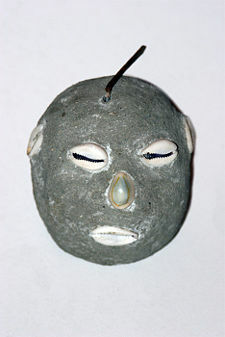 Santeria was traditionally transmitted orally, although recently a number of books have been published on the tradition. Practices include animal offering, dance, and invocations to the Orishas. One's ancestors, egun, are held in high esteem in Lukumí, and all ceremonies and rituals in the Lukumi religion begin with paying homage to one’s ancestors. The most controversial Santeria ritual is animal sacrifice. Followers of Lukumí point out that the killings are conducted in a safe and humane manner. The priests charged with doing the sacrifice are trained in humane ways to kill the animals. Furthermore, the animal is cooked and eaten afterward by the community. In fact chickens, a staple food of many African-descended and Creole cultures, are the most common sacrifice; the chicken's blood is offered to the Orisha, while the meat is consumed by all. Fruit is also offered to the Orisha. Initiation into Santeria is an involved process requiring special ceremonies and particular rituals as well as periods of abstinence. Consultation with a santero or santera is, however, open to any that are willing to make the appropriate donations - even those who practice other religions. There are four major initiation rituals in Santeria: three are complimentary and are accorded varying levels of importance amongst different groups within Santeria. One being initiated is known as an iyawó, which means "bride" and applies to any initiate. Initiation requires a fee, but this is given to the Orisha and used for the expenses incurred in initiations. The beginning step into Santeria is for the initiate to gain their elekes, beaded necklaces that are matched to the particular colors of the iyawó's parent Orisha, who is determined through ritual. The elekes are ritually bathed in a mixture of herbs and other potent magical substances, and given to the initiate. Elekes must be worn for protection, and must be removed during any ritually impure situation (menstruation, for example). Another important ritual is the creation of an image of Elegguá. Iyawós collect stones and bring them to the initiator, who chooses one (based on the result of an ensuing divination) to use as the image. The image is created around this stone, using a malleable substance (for example, clay) and shells. This Elegguá image is kept in the home and is made offerings, such as food, tobacco, or the blood of a sacrifice. Like the elekes, it serves to protect the initiate. The third of the initial rituals is the receiving of the implements of the warrior Orishas. The iyawó gains items characteristic of the three remaining warrior gods: Oggún (iron implements), Ochosi (bow and arrow), and Ósun (cup with a rooster), complimenting the final warrior god Elegguá. The final and most secret ritual is called the Asiento, a term which refers to the possession of the initiate by an Orisha. It is the culmination of the previous rituals, and cannot be made unless the others have been completed. The final ritual is agreed upon unanimously as the most important and mysterious, and can only be entered after the three lesser rituals have been brought to fruition. (However, no stigma is attached to not completing the final initiation.) It is a purification ritual, requiring a metaphorical "death" and "birth" for the iyawó. In the company of sixteen or more santeros and santeras already ordained, the iyawó becomes possessed by the Orisha that has chosen to become his or her parent god. What the iyawó speaks and does is, during this segment of the ritual, believed to be the words and actions of the particular Orisha involved. Sacrifices and periods of ritual abstinence complement this ritual. The entire ritual program takes several days, and the iyawó must return to their sponsor for further purifications in the following months. Following this ceremony the iyawó earns their ritual paraphernalia, such as the implements for divination. The role of oracles in Santeria is to help those requiring the service to learn which actions will bring them closer to fulfilling their destiny. Anyone willing to learn from a Santeria divination is welcome to do so—there are no distinctions based on religious affiliation. Some oracle practices are done only by those wholly initiated into Santeria, while others can be done by anyone who has completed only the most basic rituals. The most common oracle procedure in Santeria is the casting of coconuts. A coconut is split into four equal quarters and a question is asked that can only be answered positively or negatively. The quarters are cast and are interpreted by the manner in which they come to lie. Different combinations of the husk or inner white flesh showing face up give the one performing the ritual a "yes," "no," or instructions on re-casting the quartered fruit. Coconuts are used due to their resemblance to a type of nut native to Western Africa that is not available in Cuba. Much more powerful and insightful is the casting of cowry (a mollusk) shells, done by those who have finished their Santeria ordinations. Most often, sixteen shells are used, and are interpreted according to the number of shells facing upwards or downwards. Interpretation of the shells is much more involved—each instance is associated with a verse that is in turn interpreted in reference to the problem at hand. It is said that there are thousands of ways in which the shells can be read, and thus the task is left to those with a great deal of experience in divining with the Orishas. In Santeria, music and dance are used as forms of prayer to induce a trance state in an initiated priest, who is said to become "possessed" with Orisha, channeling them to the community and performing healing. These dances are called bembes, and they correspond to the nature of the Orisha being contacted—for instance, a dance dedicated to Oshún, the Orisha of love, will be suggestive of seduction. The efficacy of the dance is determined by the skill with which the performers complete the bembe. These dances are not sure to guarantee the goodwill of the Orisha, but instead are used to summon them. The Orisha, when channeled, can react favorably or unfavorably in response to the worshipers. As well, multiple Orishas can appear, causing difficulties if those summoned are not on good terms (such as Changó and Oggún, as demonstrated in the pataki concerning their feud). OrishaNet: A website written by a Lukumi priest. Religious Tolerance.org Page on Santeria.